I have to admit, it's been so long since I got a new split 7" from the All In Vinyl singles club, I forgot it was still going on. When I first started seeing pictures of this record online I thought that they had started up a new year that I hadn't signed up for yet. Then I realized that this was part of the club I had already subscribed to. And there's still one more 7" to go. Good times. 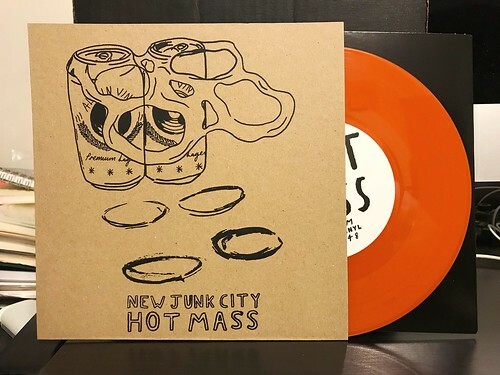 New Junk City is a band that I was blown away by from a 7" randomly sent to me to review in 2016. I was so into that record, but they completely fell off of my radar again. This split is a nice reminder that they're still out there. The songs are somewhat ramshackle in construction, with everything sounding kind of loose, but at the same time loud and exciting. The guitars are perfectly blown out and fuzzy and the vocals are raw, but still maintain solid melodies. Both of their songs on this 7" are crunchy and catchy and great. I want to hear more by these guys and I really need to pick up their first EP that I see on their Bandcamp page. Hot Mass is another band I wrote about in 2016 when their phenomenal album Nervous Tensions came out. It seems inconceivable to me that was nearly two years ago, but those are the trappings of growing old I guess. In those two years, it appears that Hot Mass have gotten even better than they were. The first song on this split is a short, catchy blast of punk rock, but it's the second song "Flatman" that is a real world beater. It's probably the best song they've released so far and it's just a perfect mix of jagged UK punk pop, with dynamic transitions and a most excellent breakdown towards the end. Hot Mass still remind me of Rumspringer, but with that extra little bit of aggression that make them stand out. This really is a hell of a split 7". Highly, highly recommended.